International Mountain Day was designated as December 11 by the United Nations General Assembly in 2003. According to the Food and Agriculture Organization of the United Nations (FAO) that leads the observance, it is an opportunity to create awareness about the importance of mountains to life, to highlight the opportunities and constraints in mountain development and to build partnerships that will bring positive change to the world’s mountains and highlands. The theme for 2013 is "Mountains - Key to a Sustainable Future". Postcard US-2260961 to Belarus showcases one of the most beautiful mountains and major tourist destinations.in China -- Huangshan. 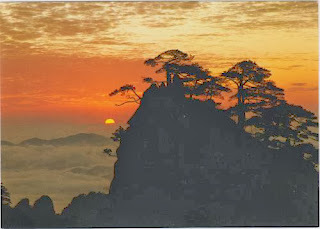 Huangshan (黄山), literally Yellow Mountain, is a located in Anhui Province. The mountain ranges were a result of the uplift movement from an ancient sea during the Mesozoic era, about 100 million years ago; then they were carved by glaciers during the Quaternary. The area is now well known for its scenery, sunsets, peculiarly shaped granite peaks, Huangshan Pine trees, and views of the clouds from above. Huangshan is a frequent subject of traditional Chinese paintings and literature, as well as modern photography (source: Wikipedia). It was recognized as a UNESCO World Heritage Site in 1990.